Dogs are our link to paradise. They don't know evil or jealousy or discontent. To sit with a dog on a hillside on a glorious afternoon is to be back in Eden, where doing nothing was not boring--it was peace." My Beautiful Angel and I at Pet-O-Ween! 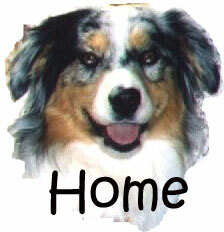 Tess came to me in September of 2002. She has truly been a blessing. Because I live in town I just didn't think having a dog would be a possibility right now. 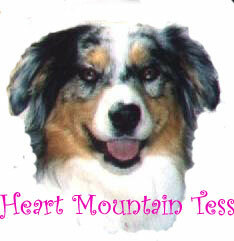 I baby-sat Tess for a friend who is the Wyoming Representative for Australian Shepherd Rescue. Tess and I hit it off right away. It just so happened that Tess needed a good home and after sending a convincing letter to my land lord she was mine! Tess is a well bred dog that has relatives who have done well in stock dog trials, and have been successfully shown in other areas such as obedience, agility, and confirmation. Tess gets along great with my cats and likes to nap on my bed and chew on her rawhide bones. She is awesome at catching a frisbee and loves to go for walks. I enjoy her company when I'm riding horse also. I couldn't have asked for a better buddy! She is pretty calm and quiet most of the time, but she really gets fired up when I come home or when she knows it's play time! I have started teaching Tess different tricks, and she is a fast learner! She accompanies me just about where ever I go, so maybe we'll see you sometime down rodeo road!